Abstract : Computer models that treat plant architectures as a collection of interconnected elementary units (internode, petiole, leaf lamina), which are spatially distributed within the above- and/or the below-ground space, have become increasingly popular in the FSPM scientific community (DeJong et al. 2011). The core of such 3-D plant architecture models deal with contrasting reconstruction methods generally based on stochastic, fractal or L-system approaches, or by describing accurately the geometry of each plant component in situ using 3-D digitizing technology. These methods can approximate the geometry of many species for understanding and integrating plant development and ecophysiology, but have generally been applied at a small scale. High-resolution terrestrial Light Detection And Ranging (tLiDAR), a 3-D remote sensing technique, has recently been applied for measuring the 3-D characteristics of vegetation from grass to forest plant species (Dassot et al. 2011). 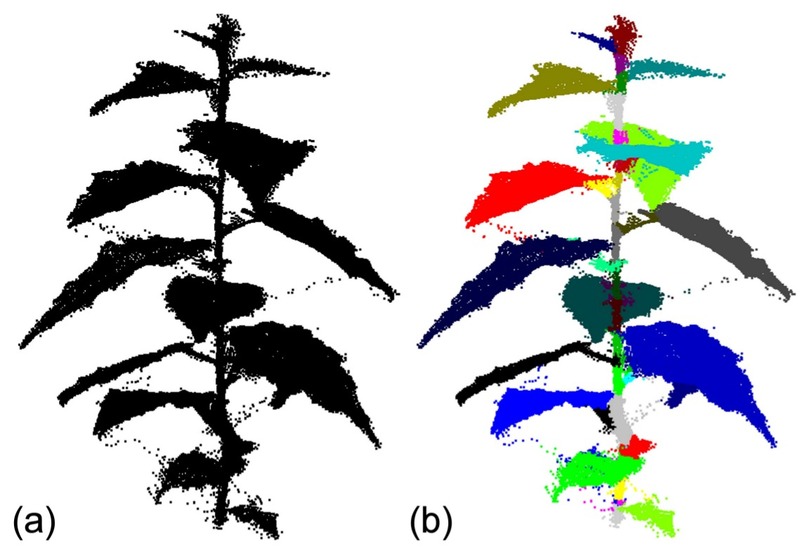 The resulting data are known as a point cloud which shows the 3-D position of all the hits by the laser beam giving a raw sketch of the spatial distribution of plant elements in 3-D, but without explicit information on their geometry and connectivity. In this study we propose a new approach based on a delineation algorithm that clusters a point cloud into elementary plant units. The algorithm creates a graph (points + edges) to recover plausible neighbouring relationships between the points and embed this graph in a spectral space in order to segment the point-cloud into meaningful elementary plant units. Our approach is robust to inherent geometric outliers and/or noisy points and only considers the x, y, z coordinate tLiDAR data as an input.